ARCHIVES - Site de Théâtre en Français à Berlin ! Hungry for the not yet discovered gesture? The Biomechanics and its usage in Performance. Philip Brehse works almost exclusively with the principles of the Biomechanic training system for actors, developed by the legendary Russian Actor and Director, Wsewolod Meyerhold and has over 20 years of experience in teaching and practicing this method in his work. This Workshop offers an extensive introduction to the actual praxis of the Biomechanics, certainly one of the most efficient methods of comprehending the body as performance Instrument. The provocation in this workshop is: How can we use these concepts and techniques originallyconceived for actors, to find fresh impulses in our work in the realm of other artistic disciplines such as Dance, and Performance Art as well as in the theatre. How can this be learned? In this 3 day Workshop, we will deeply investigate the fascinating realm of the principles at play in Meyerholds training system, the Biomechanics. The exercises have the potential of enhancing your creativity, of tuning and training your performance instrument and of discovering again the joy of constructing your performance or roles through the engagement of the whole body. We will concentrate on a broad spectrum of preparatory exercises designed to explore our ongoing play with and against gravity, develop our sense of space, partner and ensemble, and performance telepathy. We will delve into the classical "Etüdes" of Meyerhold; a provocation, which he developed with his ensemble in the 1920`s, after breaking from the confines of the extreme tendencies of Naturalism which had widely defined the Russian theatre of his time. At the end of each day, we will use the exercises in physical improvisation situations, to immediately enhance the question of usage apropos given themes today. Philip Brehse, is an actor, director, musician, teacher, performance artist and co-founder of the Open Space Performunion, Berlin. An American living in Berlin since the fall of the Berlin Wall, who allows himself the freedom of rigorously exploring creation and innovation in various art forms. He believes in the necessity of working together with artists from all disciplines and mediums and to work actively against the tendency of becoming categorized. After his studies in Acting and Directing in the Bachelor of Fine Arts Program at Ithaca College, he discovered his fascination with Biomechanics of Meyerhold through further studies and collaborations with Carlo Altomare and the Alchemical Theatre in N.Y.C. and in Europe. During the late 1980's he worked as an actor and musician with the legendary Living Theatre under the direction of Judith Malina and Hanon Reznikow and has extensively toured in Europe and Asia. Philip practical training and intensive scene study through the technique of the Biomechanics with Gennadi Bogdanov (Moscow). He completed Bogdanov`s Master class at the Expo-Hannover. He has directed and taught biomechanics and acting regularly at the Athanor Akademie in Burghausen, the Neue Schauspielschule, Nürnberg, Teatro Cinque, Milan and Academie Theatrale De L´Union, Limoges as well as countless workshops in Estonia, Germany, Poland, Italy, the University of Toronto and at the Living Theatre in N.Y.C. 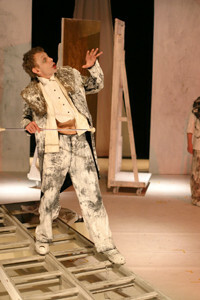 He was engaged as actor and musician at the Jewish Theatre of Berlin, (2008 –2012). Parallel to his teaching work, Philip has been active as a performer for over 25 years and has performed in practically all of the European States in a multitude of roles as actor, director, musician and performance artist, and most recently at the CUT International Performance Festival, Berlin, and the KEAF Festival in S. Korea. The Workshop will be in English and German. Workshop students must wear light sneakers with an adequate tread and a free ankle and comfortable clothing for movement. Mr. Burrus apprenticed under Stella Adler for the teaching of technique and then taught alongside her for 10 years before opening his own Ron Burrus Studio in Los Angeles. Twenty-five years later Mr. Burrus rejoined the staff in New York and merged his studio with the Stella Adler Studios, NYC for the creation of the Art of Acting Studio, Los Angeles.